African Travel Blog: Kenya Airways plans Mideast expansion! Kenya Airways is planning to boost its schedule to Dubai and is planning further routes as part of its expansion across the Middle East, the African carrier's regional manager has confirmed. "The growth potential is very strong and I believe that Kenya Airways has an exciting year ahead in this region, as our Dubai service will become double daily and more frequency will be added to the Jeddah service as well," the airline's regional manager Abraham Joseph told Arabian Business' sister title Aviation Business. "At the same time, opportunities are being explored in new markets across the Middle East… There are plans to commence a Beirut service by the middle of 2012, while flights to Karachi in Pakistan are also being considered, which will be served via Dubai," he added. Last year, the African carrier announced a new ten-year growth plan and, as part of the strategy, its fleet will triple in size to 100 aircraft. 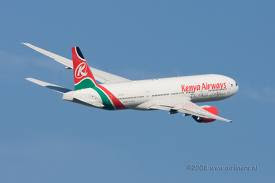 "Kenya Airways has placed an order for nine Boeing 787 Dreamliners, the delivery of which has unfortunately been delayed and will now start from late 2013 or early 2014. Kenya Airways has ordered two Boeing 777-300ERs, which will enter service in the middle of 2013. These will initially replace our Boeing 767-300ERs on the Dubai route, until the Dreamliner comes into operation," Joseph said. Kenya Airways began operating from Dubai over 25 years ago and currently operates 10 flights a week to the emirate. In addition, it operates thrice a week to Muscat and twice a week to Jeddah. "The latest economic data has indicated that Africa in the next international growth area, due to the new found wealth of many countries in terms of natural oil and gas, minerals and precious metals. Nairobi has emerged as the hub of Africa and we are determined to cover all major cities in the continent over the next two years," Joseph said.